Happy New Year! I ended up making it to midnight by some stroke of magic, though the half bottle of Moscato I had at dinner didn’t help. I slept for an obscene 10 and a half hours to make up for my raging debauchery (laying on the sofa), and I’m starting 2013 feeling refreshed and lazy. How was your NYE celebration? Tell me it was wild and that someone out there knows how to party. I’ll be in Paris in a little over two months (!!!! ), so there is a lot of apartment hunting going on. Last time, we stayed in two fabulous hotels in the 17eme, but since that wiped out all of Boyfriend’s hotel points, we’re doing what we did in Bruges on the same trip and renting a furnished apartment through AirBNB. 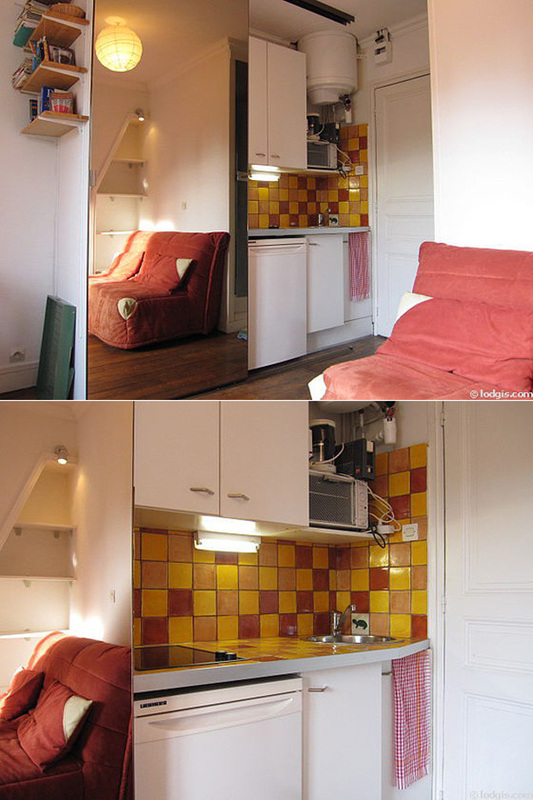 Of course, this is inspiring tons of “What if I lived in Paris in a tiny apartment?” fantasies. I’m going to start a new series on the blog this year, wherein I find teeny tiny apartments and furnish them as a way to work out my intense desire to actually make it a reality (hopefully one day it will be). Typical Parisian window, check. Wood floors, check. Bathroom with a toilet and shower that aren’t out in the hallway? Check. Hideous kitchen tile I would paint over or slap some white contact paper on? Check. But the apartment is perfect. Or it could be perfect, if I could get my hands on it. It’s enough room for me to eat, sleep, and write comfortably. And the piece de resistance? It’s only $643 a month! That ugly sofa bed needs some new sheets and a crisp white duvet set. I’d swap out that sad tv stand by the window and postage-stamp-sized television for a vintage-y dresser for added storage, and I’d take out the paper lantern on the ceiling and hang a glamourous chandelier instead. Same goes for the mismatched folding chairs and table. A bistro-esque table and chairs would be much more charming in that corner. 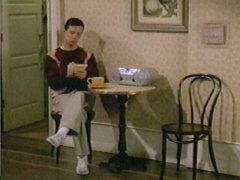 On that window sill I’d place a small radio and a set of bud vases. While I love the wood floors, a big cream colored rug would add more light and softness to the space. All that’s left to do is acquire some sweet artwork (pastel, watercolors) from the many vendors along the Seine or at Les Puces to hang on the wall and really personalize the space. Otherwise, for under $1000 in stuff that can mostly be purchased at IKEA, the studio would get an entire makeover. What do you think? Could you see yourself living in a space so small? 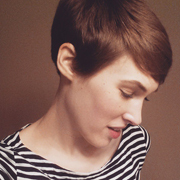 This is totally a starving-artist dream of mine, I have to admit. That’s great, you’re coming to Paris!? We have to meet up over a glass of Chablis in that case :) How long are you staying here? Since you are looking or an apartment I’m guessing it’s more then just a weekend. If it were just me and Neel (sniff, Callum will go to college one day, I SUPPOSE), we could totally do it. I love small spaces and would downsize from our current beloved home in a hearbeat. We really only live in three rooms anyway. You can and should totally paint that tile, although the bathroom isn’t terrible. Love the sloping ceilings. Love. Happy new year! So exciting you’re going to Paris, I love looking for places to stay it’s definitely the best part of the planning, this apartment’s so cute. 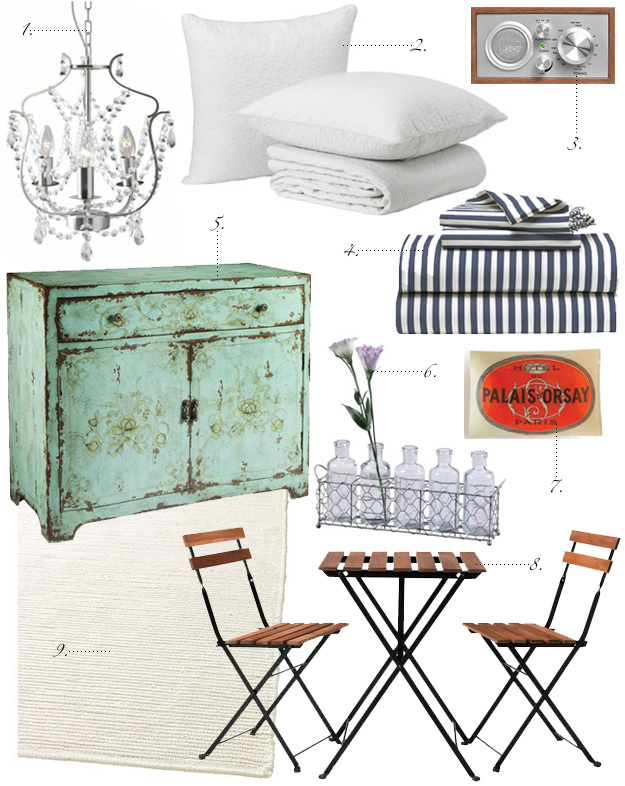 PS I absolutely love the blue dresser, just clicked through too…..tempting! If it was just me I could probably live in a space that small but if another person was living with me I would need another room, that is not the bathroom, to be able to be by myself and close a door once in a while. My student dorm room was about 100ft² and the good thing about it was that you could reach everything from the bed ;) Btw. I just added the radio and the sheet set to my wishlist! Ah! A girl after my own heart! I am so happy that you are looking to stay in an apartment rather than a hotel. 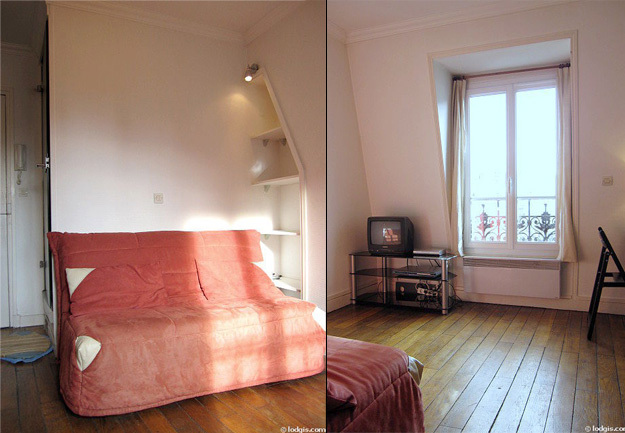 I used ParisAttitude.com to rent my apartment when I went and it was suuuuch a good deal for the 2nd arrondissement. Definitely check it out! i think my favorite news of the new year is this new series! i will dream right along with you. i cannot picture myself living in a space so tiny because i cannot picture myself (try as i might) without my three compadres tagging along everywhere i go – yes, even in my imagination. but i will live vicariously through you in doing so; which i have started doing anyway – like that upcoming trip we, er, i mean you are going on it two months! will it be really creepy if i start sending you links to paris apartments?? Yeay Happy New Year sweetie pie and congrats on making it to midnight. Even six year old Evan made it so I would have been very embarrassed for you if you hadn’t. PS you totes stole the bisto set idea from Jack…. 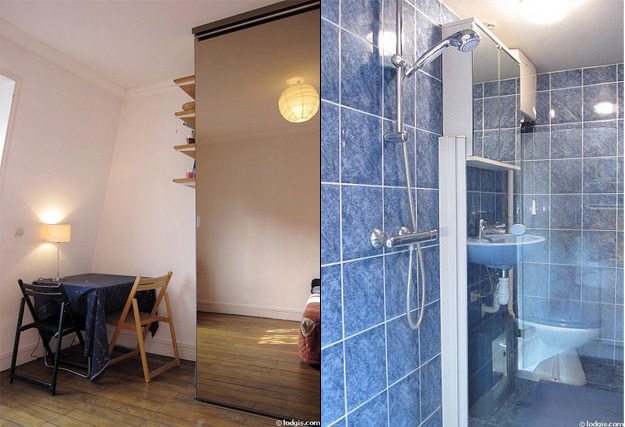 That’s a sweet little apartment, I had no idea you could squeeze a studio flat in 139ft²! You would make it look fab, I love the sheets, I only sleep in stripes nowadays. Not sure if I could live with this bathroom though. oh, and chisel those fugly tiles out of existence please!!! i lived in a studio flat for 2 years in london and loved it… though got over it by the end! too lazy to open up the sofa bed every night, or put it away for that matter so it wasn’t ideal… maybe a lovely day bed would be the best of both worlds! ps, congrats on making it to midnight! :D You and me both, sister! There’s a book called “Everything Would Be Perfect If I Lived In This House” and I feel like it could be my biography, if it was titled “Everything Would Be Perfect If I Lived in Paris.” Probably not true, but it’s fun to dream! :) Also, votre Francais c’est parfait, bien sur! I decided that I’m buying that bistor set for my patio this spring. It’s so inexpensive and chic. Happy New Year Darlin’ Here’s to another amazing year. 2013 is going to be BIG, I can feel it!! You will be taking the literary world by storm and we can all be there to celebrate with you, ha! I’ve done a lot of lazing around for the last two weeks but had some adventures too, and Den and I got the Norovirus too which was a good enough excuse to lay on the sofa for two of the days. That’s soooo small, look at the kitchen (perhaps it’s a kitch). I think I could live here with a bit of dressing up, as you have so expertly outlined. I’d have to sell a hell of a load of stuff first though! Ah the good ole’ 17eme. Give it a hello from us *eye wipe, etc*. I think technically that size flat is called a “studette”, since it is normally shoved under the eaves of the roof, and most often (as the name implies) rented by students. It has potential though! And speaking of decoration issues- we’re having major ones here in Helsinki. I’m going to take photos tomorrow and blog it, and maybe you can sort it out. I can’t look at the mess in the hall anymore. Oh yeah, and happy 2013. WHERE ARE THE HOVERBOARDS? Happy New Year, Erin! (Missed you.) What a great idea for a new blog series. You might as well utilize all that research you’ll be doing, right? That’s how I see it. 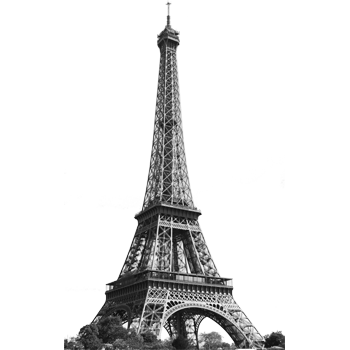 ;) I’m so excited for your next trip to Paris. It will be so much fun to live vicariously through you in the months leading up to your trip and I’m looking forward to the posts that will come out of that trip. Such a great investment!